We’d love your help. Let us know what’s wrong with this preview of Heidi Heckelbeck Has a Secret by Wanda Coven. Now readers between the ages of five and seven can read chapter books tailor-made for a younger level of reading comprehension. Heavily illustrated with large type, Little Simon's young chapter books let young readers feel like they are reading a “grown-up” format with subject, text, and Introducing Heidi Heckelbeck—a brand-new young chapter-book series with witchy whimsy! To ask other readers questions about Heidi Heckelbeck Has a Secret, please sign up. Was Heidi born as a wirth? My oldest daughter has really struggled with reading. Her struggles started in 1st grade. Because of this her reading level stayed at a "1" all last year during second grade as well. The worst part about this was finding books at her level that weren't about frogs and teddy bears. She is a typical 8 year old and loves girly things. I searched high and low for books at the correct level with topics that would interest her. We tried and failed many series and beginning chapter books. Finally, I fou My oldest daughter has really struggled with reading. Her struggles started in 1st grade. Because of this her reading level stayed at a "1" all last year during second grade as well. The worst part about this was finding books at her level that weren't about frogs and teddy bears. She is a typical 8 year old and loves girly things. I searched high and low for books at the correct level with topics that would interest her. We tried and failed many series and beginning chapter books. Finally, I found HEIDI HECKELBECK and it has answered my prayers. She is now at a level "2" in reading and this is perfect for her. Slightly challenging, but still readable. And the story! It's great and relate-able! All three of my daughters (8, 6 and 3) sit with rapt attention and listen to this book. I really appreciate that this book, unlike many others, does NOT display negative behavior by the lead characters. So many of these level of books have main characters calling their little siblings names like "pest" and "stupid" (like the "Ivy & Bean" books). I hate this behavior and don't allow it in my home. Heidi, although sometimes in a bad mood, never acts in an inappropriate or rude way to her family or peers. This is a really good book for a chapter book. I read it all in one night. Heidi is a witch, but I didn't know she was a witch, and I thought my mom was making it up. But she really is a witch! She had to keep it a secret and I think I really want to try the spell, but I don't have a medallion or the eye of a gingerbread man. Heidi is homeschooled and when she has to go to a normal school she is scared and doesn't have any friends. She makes one friend, but there's a mean girl named Melanie who is really mean because Heidi is new to the school and Melanie is super mean. She had to go to the principal's office, she was so mean! At the end, Heidi still doesn't like school or Melanie, but she has a nice friend named Lucy and her brother an mom try to help her like school too. And she says, "One thing is for sure, I'm not going to forget who I am. I'm HEIDI HECKELBECK, and I'm a witch!" I like how there are a lot of pictures, and I like how the words are bigger. It makes it easier so you don't get lost in the book. The description on this book says it's about a girl who is a witch. This is not a book about a girl who is a witch. This is a book about a girl having the most mundane, generic school day ever. How boring is that? She pulls out a spell book on the LAST PAGE. Lame-o. Lots of kids aren't going to make it that far, since the book doesn't really deliver. This is a great new series for young girls. It has easy to read chapters, with pictures on almost every page. In this first book of the series we meet Heidi and her family. Heidi has a secret, which we don't find out until the end, and it is a cliffhanger once you get to it! Heidi and her younger brother, Henry, are about to go to school for the first time since they have been homeschooled. Heidi is about to enter the second grade and Henry is about to start kindergarten. While Henry is excited a This is a great new series for young girls. It has easy to read chapters, with pictures on almost every page. In this first book of the series we meet Heidi and her family. Heidi has a secret, which we don't find out until the end, and it is a cliffhanger once you get to it! Heidi and her younger brother, Henry, are about to go to school for the first time since they have been homeschooled. Heidi is about to enter the second grade and Henry is about to start kindergarten. While Henry is excited about going to school, Heidi is nervous and does not want to go. Her biggest fears come true when she has to sit by Melanie, who is not a very nice friend. But by lunchtime, Heidi meets a new friend and starts seeing some positives about being at school. Readers will relate to Heidi's dilemmas and once they find out Heidi's secret, will really want to read the second book! My 7-year old’s rating and review. Very cute book — it was at a great reading level that he could read and understand on his own as a first grader. Lots of adorable illustrations. We are excited to continue the series! I'm not a big fan of these. I understand that starting at a school is hard but Heidi was incredibly negative, there was no hope or optimism to be found. AND it ends in the middle of the story. I can understand cliffhangers in books for older kids and teens but I really feel that this will leave the younger ones without that feeling of accomplishment they need to get when they finish a book. Make them like your book so much they want to read the next one, not because you stopped in the middle of I'm not a big fan of these. I understand that starting at a school is hard but Heidi was incredibly negative, there was no hope or optimism to be found. Eliza loved this story. I read it outloud to her and a visiting cousin. It is a chapter book but has a picture nearly every page. I was not expecting what the secret was at the end and am wondering where the author is going with it. Eliza wants to read more of these. Heidi Heckelbeck has a secret is a fun children’s fantasy novel about Heidi, a secret witch. Heidi and her younger brother Henry have been homeschooled their entire lives. This year, their parents have decided to send them to real school, Brewster elementary school. Heidi is in the second grade and Henry is in kindergarten. Heidi is very skeptical of school, but Henry is really excited. At school, Heidi is befriended by Lucy Lancaster, and bullied by mean girl, Melanie Maplethorpe. 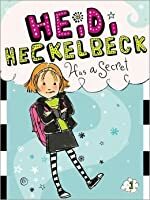 After a first Heidi Heckelbeck has a secret is a fun children’s fantasy novel about Heidi, a secret witch. Heidi and her younger brother Henry have been homeschooled their entire lives. This year, their parents have decided to send them to real school, Brewster elementary school. Heidi is in the second grade and Henry is in kindergarten. Heidi is very skeptical of school, but Henry is really excited. 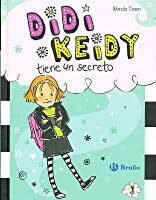 At school, Heidi is befriended by Lucy Lancaster, and bullied by mean girl, Melanie Maplethorpe. After a first day full of altercations, like the art room and play practice, Heidi decides that she has had enough. At home, when no one is around, Heidi goes under her bed and pulls out a keepsake box. Inside the keepsake box is a golden medallion with a huge W engraved on the front. Also in the keepsake box is a black leather book titled, The Witches of Westwick. Armed with her medallion and book of spells, Heidi is ready to get her revenge. Heidi Heckelbeck has a secret is the first book in this new children’s witch series. The author of this series, Wanda Coven, does a wonderful job creating this story. The diction in this story lacks complexity, which makes it an ideal read for beginner readers, and reluctant readers. 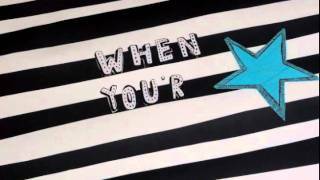 The words are spaced neatly and legibly on the page, making it easier to read. In addition to that, the paragraphs in this story are relatively small. When paragraphs are chunked like this, it reduces reader’s fatigue. This chapter book was illustrated by Priscilla Burris, who has illustrated numerous books and materials for teachers, students, and parents. The illustrations in this book are simple and serve to decorate the text. They are not too overwhelming and have a cartoon-ish look about them. Almost every page in this book has an illustration which is very helpful for beginner readers, reluctant readers, and visual learners. Some pages are entirely made up of illustrations. These picture breaks are ideal for readers who may get fatigued after prolonged reading. This fantasy novel about witches is aimed at children from kindergarten to second grade. I believe that is a fairly accurate estimate. The book was a quick and extremely easy read. It is loaded with sight words and lower intensity vocabulary, so virtually any child can read it independently. The content in this book is age appropriate and advanced comprehension skills are not required. What I appreciate the most about this book is the fact that it comes in a series. Personally, I love book series. I have read the Twilight series, the Pretty Little Liars series, Ramona Quimby, Junie B. Jones, etc. Reading books that comes in series is extremely beneficial when it comes to children. The more they read, the more they know, and can explore. This is a relatively new series, it was published in 2012. I have seen it in Barnes and Noble, Target, Walmart, the library and on Google Play. This book series is very affordable about $5 each book. That is a bargain for parents who would like to purchase books for their young readers. I thought this beginner chapter book was sort of misleading in terms of the summary, the whole her being a witch doesn't even enter the story until the very end. Heidi's family and teachers at school seemed completely fake happy happy happy that it was hard to believe. The ending just sort of dropped off. I would really only recommend this to a girl who might be starting school for the first time or going to a new school. Other than that, not really a fan. Why are kids in beginner chapter books always written as sassy? I am not a fan of my children reading how to be mean and rude to one another. I wanted this to be a series my beginning readers could pick k up, but this will be the only one from this series we read. I'd venture to say if you're fans of Junie B Jones, Ready Freddy, or Judy Moody, you might find these books entertaining as well. This is a very popular series for my third grade girls. It is a great starter chapter book. This book is the first in the series, therefore it is setting up the series. I definitely will be reading others in this series, because I want to learn more about her being a witch. Very appropriate and creative! I love this book.I love this author. It is really really good. I love this book because it is so cool and the best book I have read in my life. You are a really good author. My 6 year old daughter loved it. I thought it was a little slow and boring, but the I’m not the target audience, so I don’t mind. My daughter is excited to start the next book in the series, so I’m really happy! Anything that keeps her attention, and she looks forward to is a positive in my book! Cute little series my daughter and I are reading a chapter or two from each night. Great for read aloud! Read this to my daughter and it was so cute! We can't wait to read the entire series! My sister reads this series and loves it!! I've never read so I can't tell you guys what it is about, but she says it is a good series of books for 7-year-olds like herself. Enjoy reading!! My kids fell in love with this series after the first book. This was a cute chapter book for newer readers. It's an easy read book for a higher 2nd grader or a beginning 3rd grader. This book is golden in my house. It has turned 2 of my daughter's into readers. They can't wait to read more! This review has been hidden because it contains spoilers. To view it, click here. She is a witch! Awesome mainly because my 6yo loved it and decided to read it out loud to me! It is the best kind of audiobook! Super cute book! I’m excited to read he series with my daughter. My sister loves me to read Heidi Heckelbeck to her. It was a pretty good story until the end. Randomly finding a book series where the kids in it have the same names as my own children?? Heck yeah! We're getting the rest of them to read soon.